Somers, Connecticut, a small town near the state’s border with Massachusetts, was the site of a revolution in 18th-century transportation. 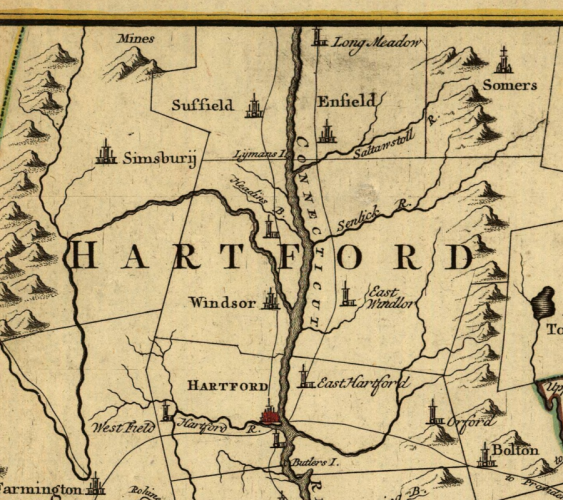 At the close of the Revolutionary War, Levi Pease, a Connecticut-born blacksmith and war veteran, opened a stage route, running between Hartford and Somers. This was the first of many long-distance stage lines Pease used to transform stage transportation from a service for the elite to one available to the average citizen. The Hartford-to-Somers route eventually expanded to link a number of major cities in the Northeast. In the process of growing his business, Pease went on to transform mail delivery in the United States and fostered innovations to the transportation industry that carried all the way into the 20th century. Pease was born in Enfield, Connecticut, in 1740. He was working as a blacksmith when he enlisted in the army at the start of the Revolutionary War. Serving in various special functions throughout the war, Pease was primarily in charge of transportation-related matters. He delivered correspondence, purchased horses and foraged for food for the army. His success eventually put him in charge of delivering horses, artillery, and supplies to Continental troops at the climactic Battle of Yorktown in Virginia. After the war, Pease took advantage of his knowledge of transportation routes and the New England area and opened his first route. The line connected Somers and Hartford, Connecticut. In 1783, he decided to expand the route to run from Hartford to Boston. In need of cash and a business partner, Pease contacted a friend by the name of Reuben Sykes, and the two men began offering transportation and delivery services between the two cities—one man leaving from Hartford at approximately the same time the other left from Boston. 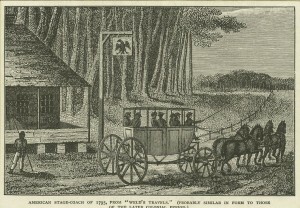 At this time, passengers did not ride in luxurious coaches but stage wagons. These wagons consisted of a rectangular box mounted on springs with side curtains and a top. The four seats did not have backs for passengers to rest against and, collectively, could accommodate 11 people. These early trips from Hartford to Boston took four days. While early runs sometimes had few, if any, passengers, interest in the line slowly began to increase. Soon taverns and inns began popping up along Pease’s route. Pease’s operation became so successful that he expanded his service so that it reached from Boston, through Worcester, Springfield, and Hartford, and down to New York. Pease, a remarkable innovator, began introducing services that carried into future transportation industries. He hired conductors to issue and collect tickets en route and handle money, thus relieving (sometimes dishonest) drivers of these distracting burdens. As more stage lines entered the business, Pease convinced his competitors to join him in opening a general ticket office to provide one point of purchase for customers of all the local lines. He also began offering “limited” service, which was an express option with fewer stops offered at a higher cost to the customer. One of Pease’s greatest successes was winning the first United States Post Office contract to carry the mail. 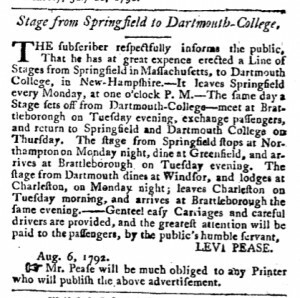 By the end of the 1700s, Pease’s operation had grown from 2, to 4, to 15 proprietors and his stage coaches carried mail from New Hampshire to Georgia. Pease’s efforts so impressed the government that, in 1799, the United States Postmaster asked Pease to come to Philadelphia and help design a reliable system to replace the poor mail delivery service that existed between Philadelphia and Baltimore. Pease took over the entire operation (right down to designing new mail coaches), providing an opportunity for the United States government to get into the mail coach business. After returning from Philadelphia, and having sold his interest in the stage line to his original partner, Reuben Sykes, Levi Pease had one last goal to achieve before retiring to his duties at his tavern in Shewsbury, Massachusetts. Like many transportation innovators, Pease recognized the importance of providing citizens with smooth, accessible, and high-quality roads on which to travel. With new turnpikes successfully completed in surrounding states like Connecticut and Rhode Island, Pease lobbied the legislature in Massachusetts for a charter to build the first turnpike in that state. The state acquiesced, and in 1808 he oversaw the building of a turnpike that ran from Boston to Worcester. By the time of his death in 1824, Pease was known as the Father of the Turnpike. The experiment he had started in Somers, Connecticut, went on to revolutionize transportation along the East Coast and had reduced mail delivery times between New York and Boston from 6 days to a mere 36 hours. In addition, many of Pease’s innovations, such as the conductor, general ticket office, and express service, were later adopted by the railroad companies that carried Americans across the nation.